Chairman Davis, Vice Chairwoman Jameson, members of the committee, thank you for allowing me to speak with you today. My name is David Cooper. I am the senior economic analyst at the Economic Policy Institute (EPI). EPI is a nonpartisan, nonprofit research organization in Washington, D.C. whose mission is to analyze the economy through the lens of the typical U.S. working family. EPI researches, develops, and advocates for public policies that help ensure the economy provides opportunity and fair rewards for all Americans, with a focus on policies to support low- and middle-income households. I am testifying in support of H.B. 0664, which would raise the Maryland minimum wage to $15 per hour by July 2023 and then index it to inflation thereafter. In my testimony, I will discuss why $15 in 2023 would be an appropriate level for the Maryland minimum wage, and briefly summarize what the economics literature tells us about how an increase to such a level is likely to affect workers, businesses, and the broader Maryland economy. I will discuss why claims that a $15 minimum wage will damage the state’s labor market are unfounded and obscure the more important question of how a $15 minimum wage will affect the welfare of the state’s low-wage workforce. Finally, I will discuss why the tipped minimum wage provisions of H.B. 0664 are critical to protecting Maryland workers. Note: Growth in average wages measures anverage wages of production workers. Inflation measured using the CPI-U-RS and the CPI projection for 2017 from CBO (2017). Productivity is measured as total economy productivity net depreciation. Source: EPI analysis of the Fair Labor Standards Act and amendments. Total economy productivity data from the Bureau of Labor Statistics Labor Productivity and Costs program. Average hourly wages of production nonsupervisory workers from the Bureau of Labor Statistics Current Employment Statistics. As shown in Figure A, from the late 1940s until the late 1960s, the federal minimum wage was raised regularly, at a pace that roughly matched growth in average U.S. labor productivity. The federal minimum wage reached an inflation-adjusted peak value in 1968 of $9.90 per hour in 2017 dollars. 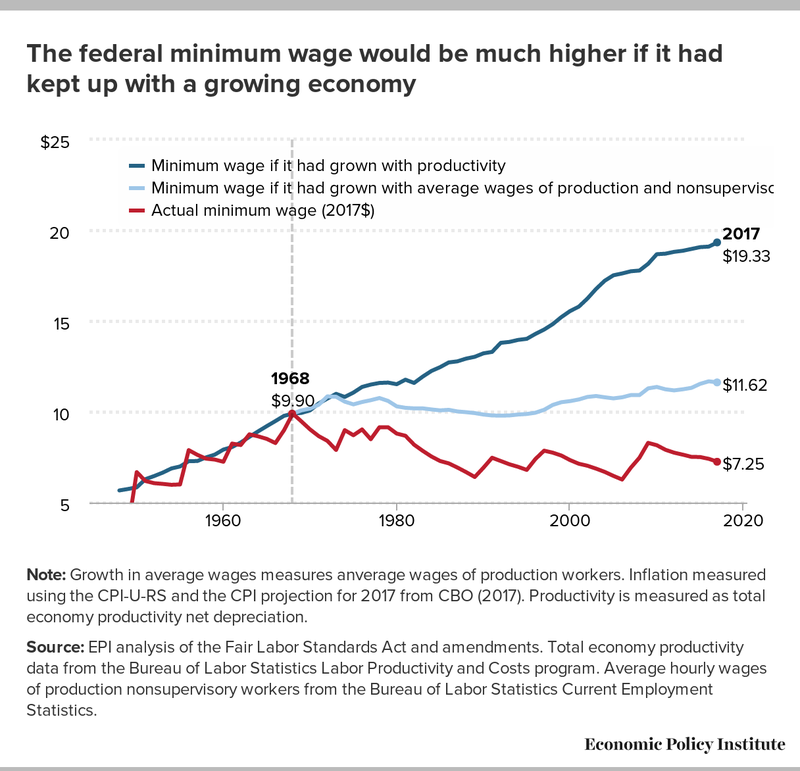 Since then, increases in the federal minimum wage have been either too infrequent or inadequate to simply keep up with inflation, resulting in a federal minimum wage that is worth 25 percent less today than it was 50 years ago. Increased inequality—specifically, greater distance between low-wage workers and workers in the middle class. Figure A also shows that the current value of the federal minimum wage and minimum wages in most states are not the result of economic necessity. If the federal minimum wage had been raised at the same pace as growth in average U.S. production-worker wages, it would be approaching $12 per hour today. If the federal minimum wage had kept pace with U.S. labor productivity, it would be well over $19 per hour today. These statistics indicate that the U.S. economy has the capacity for significantly higher minimum wages than are currently the norm. Although many states have enacted minimum wages higher than the federal minimum wage, the vast majority are still at levels below the 1968 value and virtually all are still inadequate to ensure that someone working full-time, year-round can afford a decent quality of life. For example, someone working full time, year-round at the Maryland minimum wage of $10.10 per hour that will take effect in July will earn pre-tax income of roughly $21,000. According to the Economic Policy Institute’s Family Budget Calculator—which calculates the income required for a typical family or individual to afford modest yet adequate living standards with no savings left over—it currently would cost a single individual with no children in Somerset County, Maryland (one of the least expensive counties in the state) $32,554 annually.i This equates to a full-time, year-round wage of $15.65 per hour in 2017. Similarly, a single individual with no children in Garrett County (another relatively low-cost areas of Maryland) would need $33,322 annually—the equivalent of $16.02 per hour full time, year round. Thus, $15 per hour in 2023—6 years from now—is a conservative target for setting a wage floor that affords a decent quality of life, even in the lowest cost areas of Maryland. Of course, many workers and families, especially those in more expensive parts of the state, will inevitably still require additional support through state and federal assistance programs. Notes: *Projected real values based on projections for the CPI in CBO (2017). **Describes federal minimum wage increase from $5.15 to $7.25 that occurred from 2007-2009. ***Describes Maryland's state minimum wage increases from January 2015 - July 2018. However, $15 in 2023 would still be lower than the 1968 federal minimum wage, when considered relative to the overall distribution of wages in Maryland. Economists often assess the strength of a minimum wage by calculating the ratio of the minimum wage to the median wage of a full-time worker (i.e., someone in the exact middle of the wage distribution.) As shown in Table 1, at its historical high point in 1968, the federal minimum wage was equal to 52 percent of the national median wage. In Maryland, the state minimum wage of $10.10 set to take effect in July will be equal to roughly 37 percent of the state median wage. Under conservative assumptions for median wage growth over the next 6 years, a $15 minimum wage in 2023 would equal between 47.6 and 49.3 percent of the state median wage—slightly lower than the national ratio in 1968. 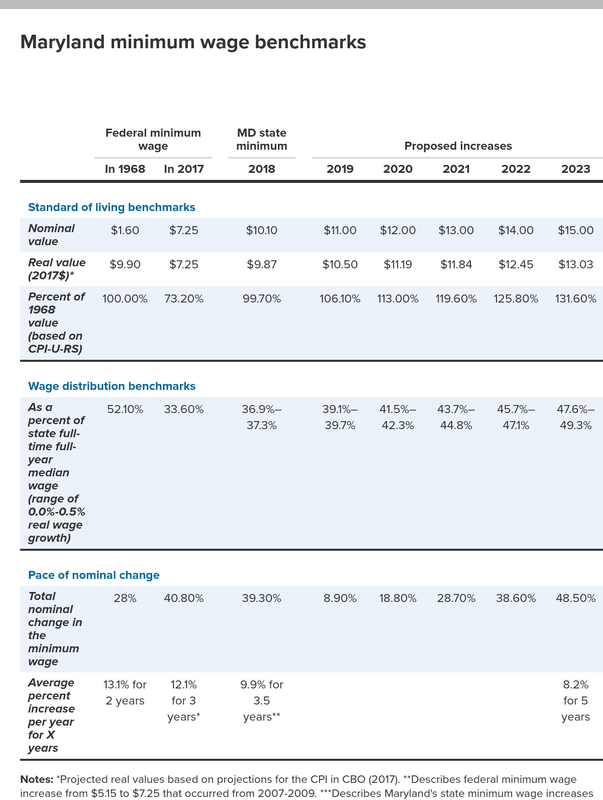 Table 1 also shows that raising the Maryland minimum wage to $15 by 2023 would raise the state wage floor at a slower pace than past increases in both the federal minimum wage and the most recent increases in the Maryland minimum wage. When the federal minimum wage was raised to its peak in 1968, it increased at a pace of 13.1 percent annually for two years. The most recent federal increase, occurring from 2007 to 2009, raised the federal minimum wage 12.1 percent each year for three years. The Maryland minimum wage increase still underway, which has raised the state minimum wage from $7.25 in December 2014 to $10.10 this coming July, will be an increase of 9.9 percent per year over 3.5 years. The proposed increase to $15 by 2023 would represent an increase 8.2 percent per year for 5 years. A $15 minimum wage in 2023 would provide the lowest paid workers in Maryland a higher wage than they have ever had before. Raising the minimum wage to $15 by 2023 would largely—although not entirely—undo the growth in wage inequality between low- and middle-wage workers in Maryland that has occurred over the past 50 years. A full-time worker at the minimum wage in Maryland would be effectively as close to the middle class as their counterparts in the late 1960s. The United States has had minimum wages at this same relative level before, with no obvious damage to the health of the labor market. Unemployment in 1968 was below 4 percent, and modestly declined over the two years following the increase to the minimum wage’s highest point ever. Given that productivity has increased significantly since then, it should be an even easier lift for the economy today to accommodate a minimum wage at this level. Various states and counties have had minimum wages of at these same relative levels at times over the past several decades. Similarly, both the United States and Maryland have raised the minimum wage at faster rates than what is being proposed. Over the past 30 years, there has been extensive research on the effects of higher minimum wages on employment, the bulk of which has concluded that higher minimum wages have had negligible effects on job growth.iii A Maryland minimum wage of $15 in 2023 would fall within the bounds of this research literature, suggesting that a minimum wage of this level would not produce effects different from what has been observed in the past. Over the past three decades, there has been a dramatic shift in economists’ understanding of the effects of higher minimum wages as each new wave of research on the topic has employed better, more sophisticated methods. Early studies of the federal minimum wage in the 1960s and 70s seemed to confirm the rudimentary supply-and-demand model of competitive labor markets, which predicts that an increase in the minimum wage above a “market-clearing rate” will lead to a loss of employment. Up until the early 1990s, the consensus in the economics profession was that increases in the minimum wage caused job losses. But that consensus began to crack with a new round of research in the mid-1990s when—after a decade of no change in the federal minimum wage—states began raising their minimum wages, creating an opportunity for researchers to more precisely study the effects of higher minimum wages. Many rigorous studies in the 1990s showed no employment losses and in some cases employment gains due to increases in the minimum wage.iv At the same time, other studies that still found negative employment effects were finding them to be much smaller than was previously thought.v By the mid-2000s, the profession was at a place of no consensus on whether the effect of increases in the minimum wage on employment was positive or negative. However, there was a growing consensus that the effect, whether positive or negative, was small. Over the last 10 years, another round of research on the minimum wage—representing the best methodological practices we have—has been peer reviewed and published in top academic journals. 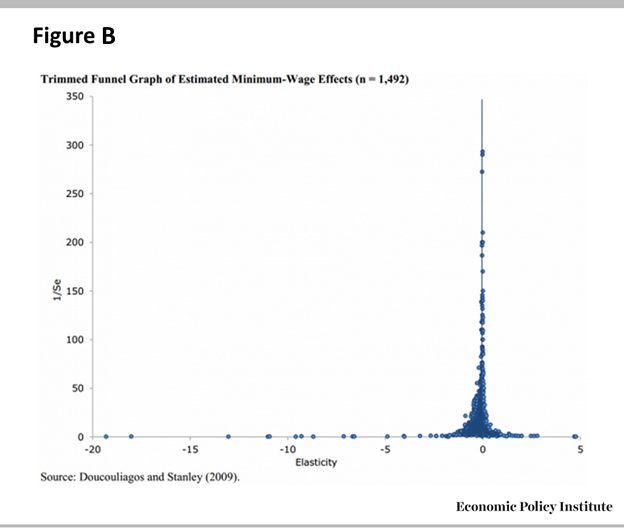 These studies find that there has been essentially no effect of increases in the minimum wage on employment, neither positive nor negative. Figure B shows the results of Doucouliagos and Stanley (2009), a “meta-study”—or study of studies—of 64 published papers on the minimum wage between 1972 and 2007. The X-axis shows the effect on employment resulting from a minimum wage increase; the Y-axis shows the statistical rigor of the study. As you can see, the results of the vast majority of studies cluster around zero, and those studies with the highest statistical power—i.e., the most rigorous studies—all fall on the zero line. Modest price increases, on the scale of 0.3–1.5 percent per 10 percent increase in the minimum wage.vii These increases can be more easily absorbed as result of concurrent boost in pay to a large portion of the region’s workforce, combined with the fact that all area businesses will be facing similar increases in labor costs—i.e., no single business will be at a competitive disadvantage if they all must raise prices. Indeed, recent job growth in Maryland has shown little to suggest that recent minimum wage hikes have been overly burdensome. Over the three-plus years since the state began raising its minimum wage from $7.25 per hour to the current $9.25 per hour, job growth in Maryland has outpaced that of all the state’s neighbors, save for the District of Columbia (which enacted even more substantial minimum wage increases than Maryland). Total nonfarm employment in Maryland has grown 4.2 percent since January 2015. Over the same period, job growth has been slower in Delaware (2.2 percent), Pennsylvania (2.9 percent), Virginia (4.0 percent), and West Virginia (-1.9 percent).viii Although such trends should not be interpreted as conclusive evidence that raising the minimum wage had a demonstrable positive impact on the state’s labor market, they do dispel claims that minimum wage increases will substantially damage the state’s job growth, or put Maryland at a disadvantage to its neighbors. As previously noted, a Maryland minimum wage of $15 in 2023 would be higher than the 1968 high point of the minimum wage in terms of purchasing power, yet within the bounds of past experience when comparing the position of the minimum wage to the wages of a typical worker. Similarly, the pace of the proposed change—increases of less than 9 percent per year—is consistent with, if not slower than, the increases that have been studied. For this reason, an increase to $15 by 2023 is unlikely to produce effects different from what has been observed by existing research. Even so, the bounds of past research should not be the limits of policymaking. The fact that past research on raising the minimum wage has not shown significant negative effects on employment should encourage policymakers to target bolder minimum wages than what has been typical in recent decades. If the modest increases of the 1990s and 2000s had little to no cost in terms of negative impacts on employment, then lawmakers could have enacted larger increases. By not doing so, they essentially left money on the table for low-wage workers. The vast majority of research on the minimum wage has found that higher minimum wages have expanded the total wages paid to low-wage workers. In other words, regardless of how job levels or employment dynamics may have changed, the population of workers affected by raising the minimum wage received more money, as a group, than they would have in the absence of the policy change. Whereas the benefits of higher minimum wages in terms of increased earnings for low-wage workers and their families have always been relatively clear, assessments of potential costs are more uncertain, particularly given the nature of the low-wage labor market. A distinguishing feature of the low-wage labor market is a high degree of churn—i.e., workers moving into and out of employment. Low-wage workers’ labor market experience is typically characterized by spells of employment and non-employment throughout the year. (Non-employment spells may be the result of a variety of factors, not limited to the availability of jobs. For example, caring for children and family members, or attending school can also limit availability for work.) For many low-wage workers the number of hours they work each week can also vary, sometimes at one job and sometimes across multiple jobs. In this type of environment, analyzing the minimum wage’s impact on the level of jobs masks the true effect that any significant change would have on workers’ actual labor market experience. If a substantially higher minimum wage led to a slowdown in low-wage job growth, what that really means is a reduction in the total hours worked by low-wage workers throughout the year. Such a reduction could manifest in a variety of ways: some workers might work fewer hours per week, some may work fewer weeks per year, and some multiple job holders may reduce their total number of jobs. In of all these cases, if affected workers are earning significantly higher hourly wages, they may very well be better off—or at least no worse off—in terms of annual income than they would have been otherwise. Thus, even if research were to show that a substantially higher minimum wage had a negative impact on jobs, it would likely overstate the actual harm to low-wage workers. And lawmakers would still have other policy tools at their disposal—such as targeted jobs programs, skills training programs, and wage subsidies—to mitigate instances where the policy change genuinely harmed some workers’ access to adequate employment. Finally, I’d like to discuss the importance of raising the state’s tipped minimum wage and eliminating the differential treatment of the tipped workforce—a step that nine states have already taken. Given improvements in productivity, low-wage workers in Maryland and throughout the United States could be earning significantly higher wages today had lawmakers made different choices over the past 50 years. As such, the question for policymakers today should not be whether we can have significantly higher minimum wages, but rather, on what timeframe can we achieve such levels. Raising the Maryland minimum wage to $15 an hour by 2023 would finally raise the state’s wage floor to a purchasing power above the previous high point set in the late 1960s. It would simultaneously return the wage floor to nearly the same position it had at that time relative to the wage distribution in Maryland, undoing much of the growth in wage inequality that has occurred between wage-earners at the bottom and those in the middle class. The bulk of the research on the effects of higher minimum wages has found that past increases have achieved their intended effects, raising pay for low-wage workers with little to no negative impact on employment. Moreover, even if there were some negative impact on jobs, the benefits in terms of larger total pay for low-wage workers are likely to vastly exceed any potential costs in terms of reduced job growth. In the high-churn low-wage labor market, even if a wage hike did reduce growth in low-wage jobs, it still may not adversely affect the welfare of most low-wage workers. What matters is the resulting effect on workers’ total annual work hours and net earnings. 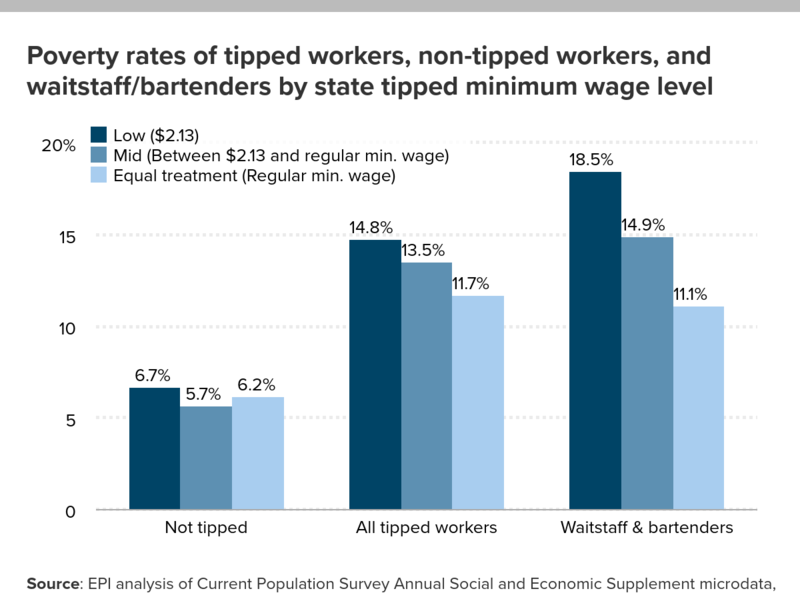 Gradually raising and eliminating the separate, lower minimum wage for tipped workers should also be a priority for lawmakers. In states where all workers are protected by one minimum wage, wages are higher and poverty rates are lower for workers who receive tips—with no evidence whatsoever that restaurant industry growth has suffered as a result. I strongly encourage the committee to pass H.B. 0664 and guarantee all Maryland workers a wage that gives them a shot at a decent life. i. Data from Economic Policy Institute (2018). iii. For a review of this literature, see Belman and Wolfson (2014) or Kuehn (2014). iv. The most famous of these studies was Card and Krueger (1994). v. For an example, see Neumark and Wascher (2008). vi. For greater detail, see Schmitt (2013). vii. See Allegretto and Reich (2018). viii. Author’s calculations from BLS Current Establishment Survey data, January 2015 to December 2017.
ix. See Lynn et al (2008). xi. Calculations using the Quarterly Census of Employment and Wages. See Gould (2016). xii. See Allegretto and Nadler (2015). Doucouliagos, Hristos and T. D. Stanley. 2009. “Publication Selection Bias in Minimum-Wage Research? A Meta-Regression Analysis.” British Journal of Industrial Relations, vol. 47, no. 2, pp. 406-428. Economic Policy Institute (EPI). 2018 (forthcoming). “Family Budget Calculator” (update). Neumark, David and William Wascher. 2008. Minimum Wages. Cambridge, MA: The MIT Press.